The Obama administration is pressing Israel to enter into negotiations with Syria aimed at compelling an Israeli retreat from the strategic Golan Heights, WND has learned. Syria is in a military alliance with Iran. 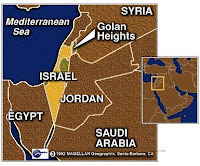 The country twice used the Golan, which looks down on Israeli population centers, to mount grounds invasions into the Jewish state. Informed Middle East security officials tell WND that Dennis Ross, an envoy for the White House in the Middle East, visited both Israel and Syria last week to discuss specifics of a deal in which Syria would eventually take most of the Golan. According to the security officials, Ross is slated to become Obama's main envoy to the Israeli-Palestinian affairs issue, with the current envoy, George Mitchell, expected to step down. With Israel, Ross discussed specifics of a deal with Syria, including which territory Israel would be expected to evacuate in both the Golan and the Jordan Valley, the security officials said. The officials said that Ross told Syria it needs to scale back its relationship with Iran and stop facilitating the re-armament of Hezbollah. The Iranian-backed Hezbollah reportedly now has over 10,000 missiles and rockets, including a large number that can reach Tel Aviv and beyond. During the 2008 Second Lebanon War, Hezbollah's rocket attacks against the Israeli north in 2006 killed 43 Israeli civilians and wounded more than 4,000. The Middle Eastern security officials, meanwhile, told WND there were some signs U.S.-led economic sanctions against Iran are having an effect on the regime in Tehran. The officials said that in recent months, Iran decreased its funding to Hezbollah as well as to the Palestinian terrorist organizations Hamas and Islamic Jihad.